When to use a baby Walker? Walkers have long been the most common method to increase physical activity of kids. However, among pediatricians, there is no consensus regarding the age of the child, the right to use the Walker, however, as about the benefits from their use. Using hodokovskogo device on wheels child can independently move in the apartment without adult, allowing parents some time to free your hands to do other things. The baby pushes off the floor with legs, that develops his ability to walk and vertical location, as well as strengthens the leg muscles. The optimal age for the use of walkers is 7-8 months, in which children can sit up independently, confidently keep your head up and stand with support. At 7-8 months of age the child should move actively, as it continues to form the musculoskeletal system. There is a view that long stay in the Walker affects a child's ability to crawl, and it was crawling strengthens the muscles of the back, which is necessary for proper biomechanics of walking. Furthermore, a constant walking with support can have a negative impact on the first steps of a child who is simply afraid to make the first movement without support. Also being in the Walker correctly distributes the body weight on the pelvis and spine in the absence of full opiranie feet to the floor, resulting in can develop curvature of the spine or misalignment of the vertebrae. Often there are consequences of walking with a Walker as clubfoot, flat feet or a habit of walking on the toes. The advantage of the Walker is the fact that the finding of the child in an upright position speeds up not only his physical but also mental development. Through independent movement of a toddler discovering the world, expanding their horizons and learning more new things. At this time, the young mother can get some rest, pay attention to restore the physical and mental strength. 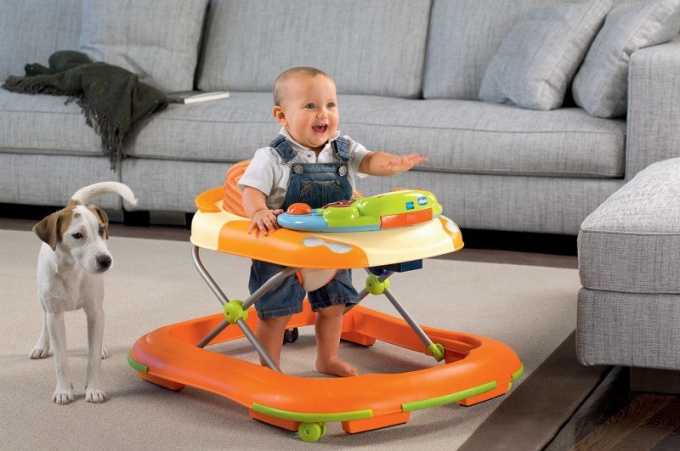 Also walking with a Walker stimulates the development of intelligence and coordination of a baby due to the ability to turn in different directions, to look and to approach interesting objects, the child receives more information and trains your vestibular system. Active movements have caused children positive emotions and improving the blood circulation, which beneficially affects the entire body and accelerates its development. If you use a Walker for a child to watch, because they do not guarantee complete security.